Bugatti is planning to set a new speed record for production cars with its upcoming Chiron, a £2m supercar with a speedometer which reads all the way to 500km/h (310mph). The company, which belongs to the VW Group, already holds the record with the Chiron's predecessor, the Veyron Super Sport, which reached 268mph in 2010. And although the Chiron's top speed is electronically limited for now, Bugatti is confident it can break its own record once the limiter is removed. The answer comes from the brand's CEO, Wolfgang Durheimer, who recently spoke to Autocar on the matter: "We will try to lock in a new world speed record. I know the Chiron will be faster, but we don’t know how fast. We have calculations from our simulations, but it is always different to sit in the car and actually do it." Set in 2010 at the Volkswagen's Ehra-Lessien test facility by former Formula 1 driver Pierre-Henri Raphanel, who took the Bugatti Veyron Super Sport up to 268 mph (431 km/h), the world speed record for road cars should be demolished by the Chiron, as the manufacturer's latest hypercar is believed to be capable of reaching 288 mph (463.49 km/h). Bugatti is aiming for its own 268-mph record, but that isn’t the only “world’s fastest” claim out there. In 2014, a Hennessey Venom GT reached 270.49 mph at the Kennedy Space Center in Florida, but that attempt was not recognized by Guinness World Records because the car didn’t make runs in both directions to compensate for wind. The records are close enough that the Chiron may be able to beat both, becoming the undisputed speed champion. Production versions of the Chiron will be limited to 261 mph, but Bugatti will disengage the limiter for any record attempts. It did the same thing with the Veyron Super Sport in 2010, which led to that car’s record getting briefly rescinded. Guinness declared that any modifications violated the definition of “production car,” but then changed its mind. The Chiron certainly has the goods to go up against the Veyron Super Sport, and pretty much anything else. Like the Veyron, it’s powered by an 8.0-liter quad-turbocharged W16 engine. But the Chiron boasts 1,500 horsepower and 1,180 pound-feet of torque, compared to 1,200 hp and 1,106 lb-ft. for the Veyron Super Sport. 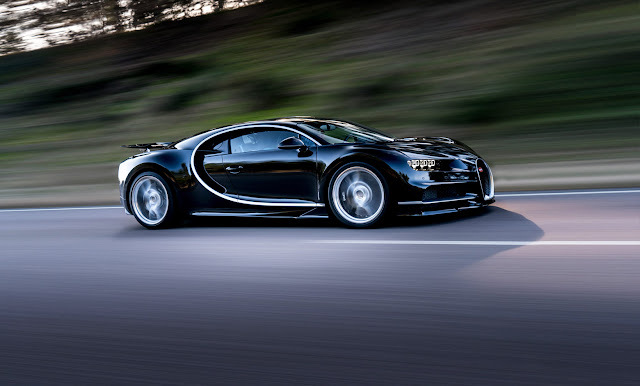 In addition to a world-record top speed, Bugatti promises 0 to 60 mph in less than 2.5 seconds. Bugatti will likely set the Chiron loose at parent Volkswagen’s test track in Ehra-Lessien, Germany, where all Veyron record attempts were done. The circuit includes a five-mile-long straight, making it one of only a handful of places in the world where Bugatti can take its cars to their top speeds. Bugatti hasn’t decided when it will make the Chiron record attempt.